White Rhinoceros. The white rhinoceros is the second largest land mammal exceeded only by the elephant. But while no one disputes its size, equally no one has ever seen its skin white. The answer lies in the Afrikaans word "weit", meaning broad. 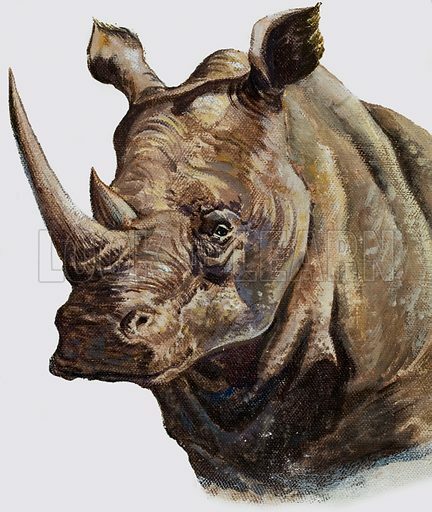 The early Boer settlers in South Africa used the word to describe the rhinoceros's broad, square mouth - and the British changed it to "white". Original artwork for illustration on p7 of Look and Learn issue no 980 (20 December 1980). Lent for scanning by the Illustration Art Gallery. Available worldwide for immediate download up to 3,675 x 4,354 pixels.